The Time Service building on the grounds of the U.S. 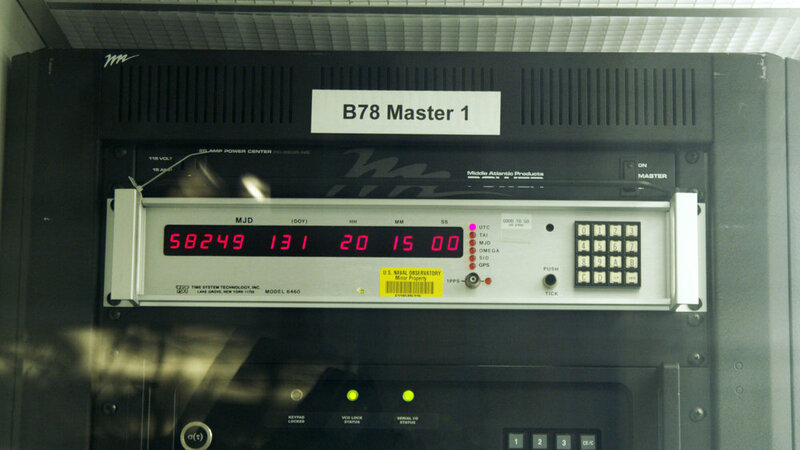 Naval Observatory houses the atomic clocks that generate time for accurate GPS navigation. Located in Washington D.C., The U.S. Naval Observatory was founded in 1830 for the purposes of aiding navigation at sea. At that time, they calibrated mechanical marine chronometers for ships to successfully locate their longitude. In short, this required two clocks on the ship; one keeping the ship’s time and one keeping Greenwich Mean Time (GMT). The ship’s longitude was calculated using the difference between these times. These days, a constellation of GPS satellites uses the time generated at the U.S. Naval Observatory to triangulate global position. 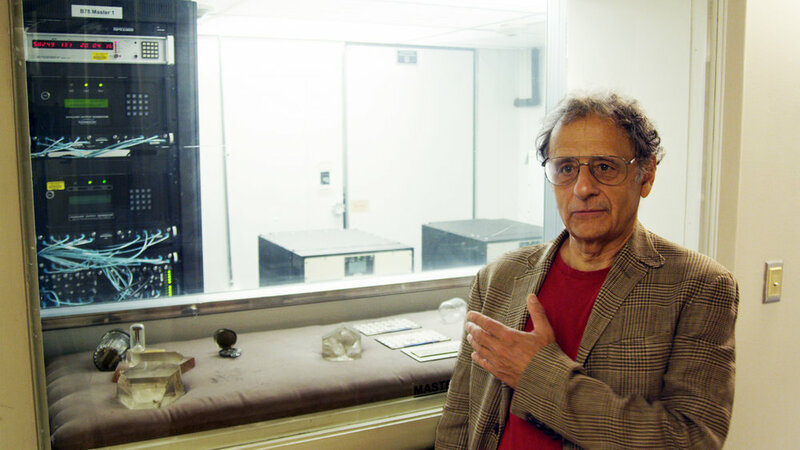 Dr. Matsakis stands at Master Clock 1. Dr. Matsakis explains, "It is THE Master Clock with a capital 'M' for The Naval Observatory. It generates the physical signal that realizes time." To the right of Master Clock 1 are two Hydrogen Maser Clocks, which are more accurate over a shorter period of time than cesium clocks. The U.S. Naval Observatory keeps time with over a hundred atomic clocks. Atomic clocks tell time like almost any other clock – by oscillation (movement back and forth at a regular speed). The swinging of a pendulum in a grandfather clock, the extension and contraction of a hairspring in a mechanical wristwatch and the vibration of the crystal in a quartz watch are all oscillators. An atomic clock is a clock that gets its time from the oscillations of an atom. In the case of the cesium atom, its radiation oscillates at a very specific frequency: 9,192,631,770 Hz (cycles per second). These atomic clocks are very accurate; Yet, not the most accurate. Dr. Matsakis shows us The Naval Observatory's decommissioned Shortt Clock. Developed by William Hamilton Shortt in collaboration with horologist Frank Hope-Jones in 1921, they were the most accurate pendulum clocks ever produced commercillay. Shortt Clocks kept time with two pendulums, a master pendulum swinging in a vacuum tank (left) and a slave pendulum in a separate clock (right). This system allowed the master pendulum to swing with little air resistance and no mechanical disturbance. It transmitted its time to all the Western Union stations across the U.S. so the country's time be would synchronized. Around World War II this Shortt Clock was replaced by more accurate quartz crystal clocks.